This post is sponsored by Cetaphil. All thoughts are my own. Okay so I have to be honest, my mornings since having Ophelia have been maybe the least productive time of the day. Jessamyn actually is the first to wake up, which leads to the inevitable panic about whether or not there will be breakfast... at which point Ophelia decides it is also time to panic and assume she too is going to starve to death. So basically my entire morning is spent running back and forth between two hungry creatures, all while also trying to take care of myself. 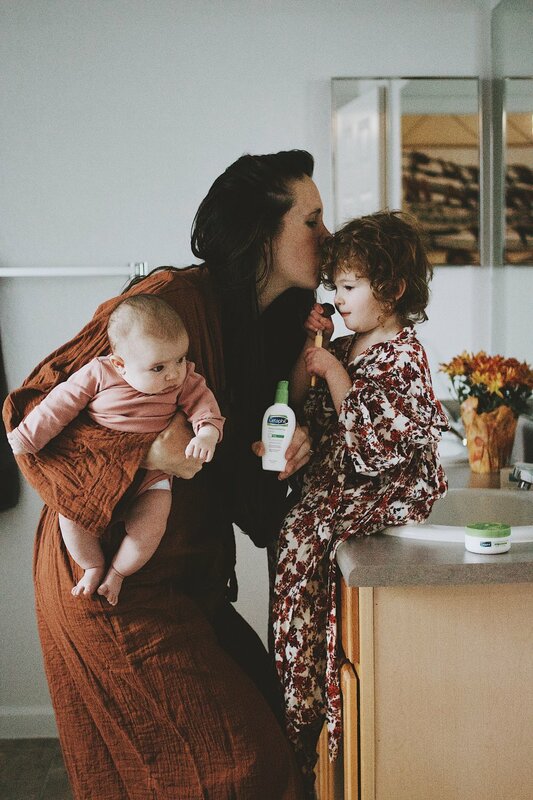 I am almost three months into this business of mothering two kids and I have to say one thing I have been really bad at BUT am working on changing: self-care in the mornings (and, well, honestly at night, too). 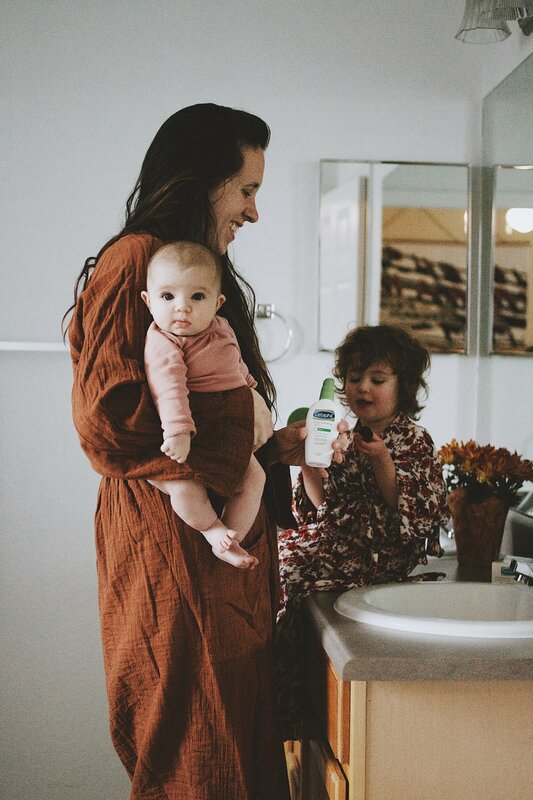 Usually I am the last to eat, shower, get dressed... basically keeping two tiny people alive kind of consumes my day, which makes sense, but at the same time I am realizing that I am a better mother (and human being) when I take some time to do just one thing every day that is for me and my well-being. This post is sponsored by Cetaphil, BUT all thoughts are my own and the little bit of self-care I am going to share with you is something I’ve actually been doing that has brought a little bit of goodness to my morning (and evening) routine. Living in Colorado, the seasons are harsh and dry, which takes a toll on my skin. I’ve been really bad about taking care of myself postpartum, but just started using Cetaphil Daily Hydrating Lotion in the morning and Rich Hydrating Night Cream in the evening. It is funny, but such a small thing like changing my routine has made such a difference in how I feel throughout the day. So basically, both of these products have been really awesome as far as helping me get in a little bit of self-care (which, hey, don’t judge… you know that refreshing feeling of washing your face? Yeah, that is totally self-care!). AND they are really wonderful for the winter months, which I am excited about because I always struggle with my face being really dry during that season. I may not have our mornings down to a perfect science where I always get to shower, or drink my tea warm, or prevent all the tantrums… BUT I am trying and I am learning that self-care starts with little things. These little things can be the difference between a good day and a bad day! So my question for you is what does your morning (or evening) self-care look like and how are you taking care of yourself in little ways? I hope that someday I’ll have a routine down that involves me getting to sleep in and wake up to breakfast in bed (I mean a girl can dream, right?). For now, that self-care looks like little things… drinking my tea warm, washing my face and using a good moisturizer. I hope you have (or will find) your own little morning self-care routine because it really makes all the difference! ps. If you want to try Cetaphil Mosturizer click HERE to save.